There was a time not too long ago when Subway was the healthy antidote to greasy fast-food offerings. Remember that guy who lost a lot of weight by eating Subway and became its spokesman (then was scrubbed from company history after being revealed he did some really heinous things?). So Subway has lost much of its luster as margins tightened (R.I.P. $5 footlong) and more competition ate into, no pun intended, its healthy-fast-food monopoly. But you wanna know how bad they’re really doing? Someone pre-made this graphic on Getty Images, and we’re using it as our header photo. Damn. A Bloomberg story today painted more bad news for the chain: More than 1,100 Subway locations closed in the U.S. in 2018, marking the third straight year the chain has shut down more shops than it opened—about a 4-percent drop. Subway is still the most ubiquitous restaurant worldwide, with more than 40,000 locations. Digging around in the yearly QSR 50 rankings (QSR is the trade publication of the quick-service restaurant industry), the last year Subway grew was in 2015, when it ended the year with 27,103 locations in the U.S., up 145 from the previous year. The latest edition of the QSR 50 available goes through the calendar year 2017, when Subway ended the year down 866 stores from the start of the year. 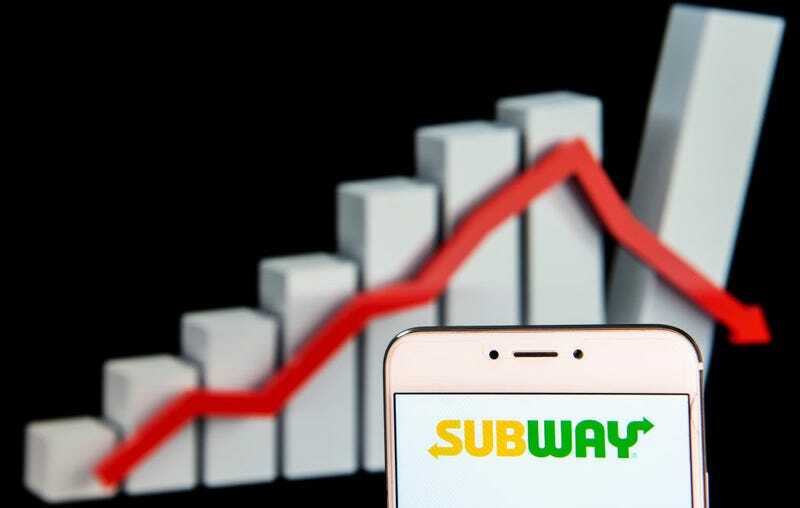 By QSR’s measure, Subway remains the third largest chain in America, behind McDonald’s and Starbucks, though Burger King is rapidly closing in. What’s the high-level explanation for this? If you want a sandwich of the non-burger/non-hot dog variety, Subway isn’t the only game in town—within a half-mile of my office I can visit Jimmy John’s, Panera Bread, Au Bon Pain, Pret A Manger, and Jersey Mike’s, options mostly not available 15 years ago. A spokesperson for Subway told Bloomberg the company is investing $80 million to improve their menu and customer service. Is the salami bloom is off the whole-grain rose? We’ll find out, but it sure seems the climb back up is only going to get harder. Subway: We can make hipper sandwiches!